Perhaps one of the most annoying things you can encounter in your kitchen is the remains of a meal someone has given up on eating. Whenever you see such things just take the food into a small compact plastic container and clean the utensils and dishes used for the certain leftover. If no one returns for the remainder of that half-eaten meal feel free to eat it yourself or just throw it away in the container or outside of it. It depends whether you want a mess in your garbage or not. Garbage disposal is in general very helpful but there can be frequent reasons for complaints connected to it like its noise and troubles with the cleaning system. For example, many people mistake the kitchen light for the garbage disposal switch. If this is your case then all you have to do is to mark the buttons differently so that they can be differentiable. 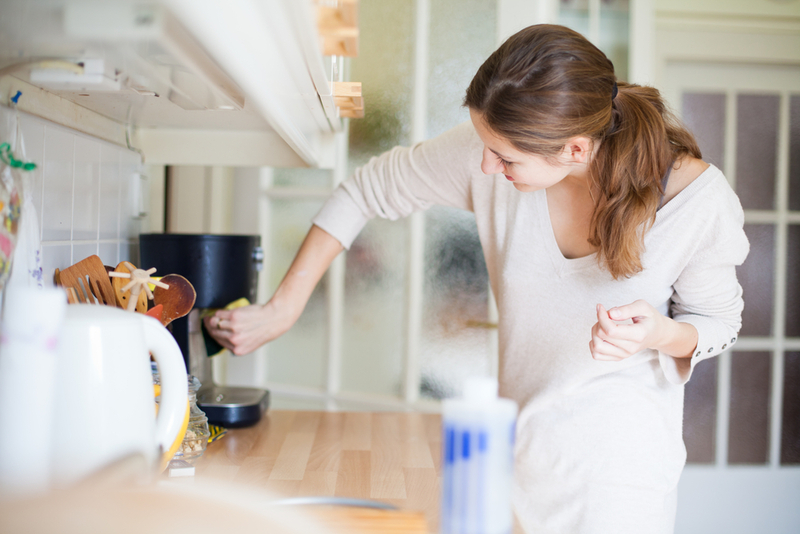 Another popular and frequently occurring problem is the connection of the dishwasher with the garbage disposal. It is a good idea to turn the garbage disposal on whenever there is hot water running through. This will ease up the cleaning process significantly. Following these two tips will allow garbage disposal to be of great use to you. The kitchen is one of those places in which you can’t escape from stains and you just have to know how to deal with them. Objects and devices made of hard metal, like steel for instance are pretty much the first to get stained. Any stains on them are easiest to remove with vinegar on a sponge. After you have rubbed hard and washed, make sure you dry the spot in order to avoid any marks on the surface. If you check out heel marks anywhere in the kitchen, there is a very simple answer to the problem of removing them – a pencil eraser. If you have problems with soap film you can easily remove it by putting one ordinary cup of vinegar in the dishwasher, of course without putting any utensils or plates in the machine. Everything inside will be as clear as it was the first day you bought it. Soap film isn’t dangerous or unhealthy but it doesn’t feel good when you take out your dishes and they have old cleaning material on them. If you ever open the fridge and realize that the mixture of smells inside are strange and unpleasant that means that you are not using it right. You have to put everything in a separate container and the fridge will smell as fine as ever. If you want to give the fridge a pleasant smell just drop some cotton into vanilla and let it stay in the corner of the refrigerator. You could also put some lemon juice on the cotton. You will not regret doing it and you most certainly won’t regret the pleasant smell. If you ever take out your dishes from the dish washer, or if you are cleaning them by hand and see that a piece of food won’t come off, just put some baking soda over it and run the hottest water through your sink. Stuck food won’t stand a chance. You just have to wait for the soda to take effect and then you need to place the dish under the hot stream. Grace is a writer and an expert in the field of house organization and cleaning. Read more at: http://www.housecleaning.org/ .